Draw for the Werzer Cup in Austria. 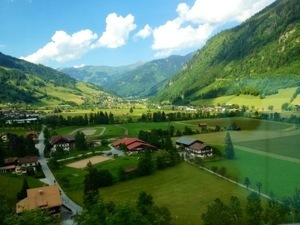 Sunday I took the train all day to Portschach, Austria from Baden-Baden Germany. I left Baden-Baden at 7:52am and by 9:15 had changed trains twice (In Mannheim and Heidelberg) and was on a nonstop to Poertschach. I arrived there about 5:15, 10 minutes late. In contrast to Germany, it was really hot in Austria, approaching the 90s. I was picked up by the hotel and joined the Friendship Cup ladies for dinner. Mary and Ralph Wilson sponsor the Friendship Cup biannually. It’s a competition between the USA and International players from the rest of the world who are 75 or over. The players are tournament players and are selected by lottery. Click here to read more about this event. Most of them played in the European Senior Championships the following week and the Americans did well. Click here to read the blog. I am seeded second in the 55s behind Gundy Wieland from Germany, with whom I am playing doubles. I had a bye for Monday. The times for Tuesday were posted after 7pm and I found out I played at 6pm. Everyone else played at 10:30. 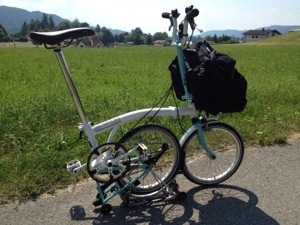 My opponent was local and had to work so they accommodated her…she’s Austrian, that’s the way they roll in Austria. 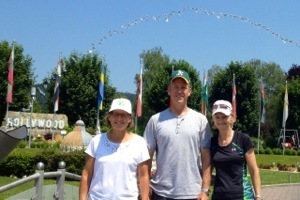 Since I had the day off on Monday I went with Kathy Langer and Lyn Tietz and Lyn’s son on a boat ride to Velden at the northern end of the lake, the Worthersee. My hotel looks over the sea. 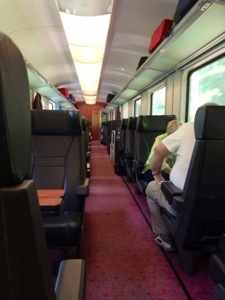 Then they were going to Minimundus in Klagenfurt on the south end of the lake so I took the train (their car was stuffed, no room for one more person) and biked from there to Minimundus which is by the sea. After asking a few postmen and passersby where it was I arrived and met up with them. 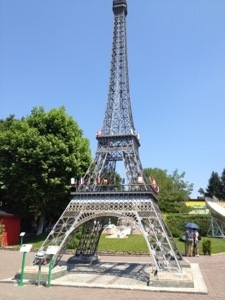 This is a tourist spot which has miniature replicas of the great sights of the world, such as the Taj Mahal, Sagrada Familia, Steven’s Church in Vienna, the Eiffel Tower, Leaning Tower of Pisa, Blue Mosque, Statue of Liberty etc. It was interesting since I’ve been to a lot of the places they miniaturized. There were also a lot of trains running around. We said good bye after that, they are touring, Vienna, Salzburg, etc and I biked back to Poertschach along the lake, 40 min or so. Today I had a match and practiced with Hugh Thomson. 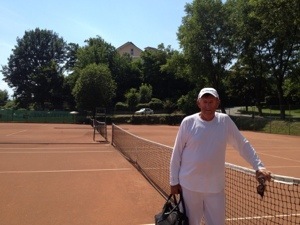 The courts were empty at the main site but nonetheless we were forbidden to practice there.So we walked about a mile and a half to some courts that belonged to a nice 5 star hotel…it was so nice that the guy mowing the lawn was wearing a tie! I also met up with Heide Orth from Germany. My match was interesting. My opponent was a bit late (no problem for her) and was fast though she had unorthodox strokes and hit more than one backhand as a left handed forehand. I also learned that on clay a ball that is 99% out…is out. I won 62 60 but it took a while and my opponent was convinced she’d won the 4th game of the 2nd set…she had been up 40-15 but then hit 2 balls out and eventually I won the game…Hugh was watching and concurred. She probably is still not convinced! I have another day off tomorrow…the tournament needs to make sure that the hotel rooms stay full all week…meanwhile the draws are shrinking and almost gone below age 50. Starting the draws early, then giving days off is one of the reasons no doubt. Tomorrow I’ll try and find someone to hit with and watch a couple of Americans play.